The 34,000-acre Chaco Culture National Historical Park is home to many ancient wonders including the remains of a civilization that thrived over 1,000 years ago. The park, which has been protecting its archaeological riches since it was established in 1907, is now protecting its views of the starry skies too. It has just been named as the International Dark-Sky Associationʼs newest Dark Sky Park. As a Gold-tier IDA Dark Sky Park, Chaco has shown its commitment to preserving its near-pristine night skies. The park has adopted a set of strict lighting guidelines that include the use of dark-sky friendly lighting now and in the future, ensuring that it will do its part to keep the nighttime environment natural and unspoiled for generations to come. The Advance of Electric Light Has Sent Nighttime into Retreat, With Astonishing Effects On Humans and Wildlife. The town in rural Maine where Ian Cheney spent much of his childhood has about 4,000 residents. Waldoboro had electric lights, but on a cloudless and moonless night, it was impossible not to be struck by the incredible array of stars visible above. But when Cheney moved to New York City, his familiar world of light and dark was upended. In this metropolis, light was everywhere —but starlight was much harder to find. Over 1,600 square miles of New Zealand’s South Island have just been proclaimed as an International Dark Sky Reserve, making it the largest in the world. The Aoraki Mackenzie International Dark Sky Reserve (IDSR), comprised of the Aoraki/Mt. Cook National Park and the Mackenzie Basin, is the fourth such dark sky reserve in the world. one of Africaʼs largest private nature reserves, has expanded its conservation role to include preserving the star-filled nighttime skies that shine above its dunes and mountains. These efforts in night sky conservation have earned the reserve high honors as the International Dark-Sky Association has just announced that NamibRand Nature Reserve is the worldʼs newest International Dark Sky Reserve. The stars at night are big and bright in Texas’ Big Bend National Park. The park was recently designated as an International Dark Sky Park, one of now just ten in the world. Big Bend National Park (BBNP) came in at the ‘Gold Tier’ level meaning that the skies above the park are free from all but the most minor impacts of light pollution. Measurements by the National Park Service Night Sky Team show that the Big Bend Region offers the darkest measured skies in the lower 48 states making it a worthy jewel to the worldwide crown of dark sky oases recognized by the International Dark-Sky Association (IDA). With an area of over 801,000 acres, Big Bend National Park is also the largest International Dark Sky Park to date. 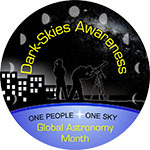 The Village of Homer Glen, Illinois, became the world’s third International Dark Sky Community on 21 November. Located 30 miles southwest of Chicago, Homer Glen’s proximity to a major city presented large challenges but also valuable opportunities to raise awareness on the negative effects of wasteful outdoor lighting. A primary goal of the International Dark Sky Places program is to improve sky quality relative to an area, and Homer Glen has worked hard to provide a respite to the famously excessive lighting of Chicago. Sky glow prohibits astronomical quality skies, but Homer Glen’s statewide leadership and education campaign for smart lighting policy has earned the recognition of this prestigious award. Work in Homer Glen is — hands down — the initiator of the dark sky movement for the entire state of Illinois. The Village passed the state’s first stand-alone lighting ordinance in 2007, and its promotion of Earth Hour attracted the support of then-Lieutenant Governor Pat Quinn, who commended Homer Glen for its “environmentally friendly” outdoor lighting ordinance in 2008 during a ceremony held jointly by representatives of IDA and the World Wildlife Fund.